This week it officially hit one degree outside…and my hair hit critical status. I’ve got 99 problems in life and today, bad hair was one of them. So I walked into my linen closet (which is mostly just products at this point) and gathered up my army of anti-winter products to give any form of life back into my locks. Here’s my HG products and as a bonus, they’re all budget friendly! Elastic hair ties are the new bobby pins…I keep buying more and more but I can never seem to find one when I need it! Anyways, I’m onto a brand new routine of argan oil, repair conditioner and lightly waxing to smooth down those baby hairs every day and it’s made a big difference! 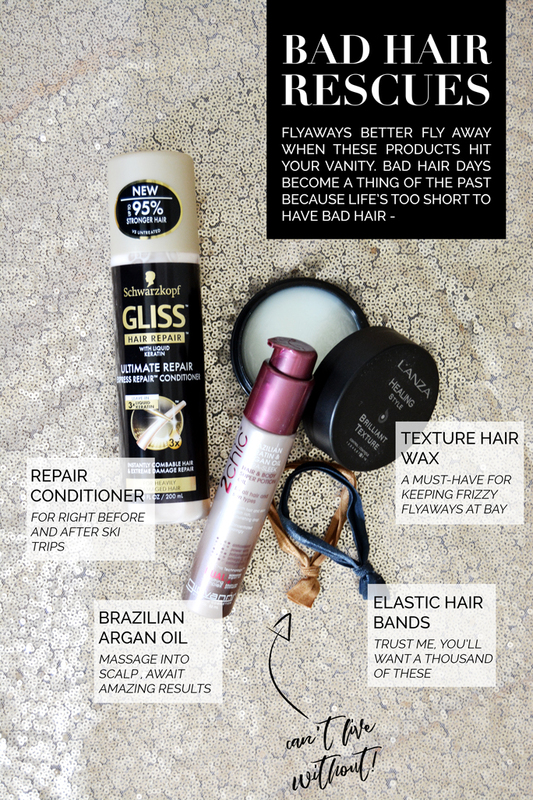 These winter hair tips are more than just tips, they’re winter hair rescues. Definitely pick up a product or two, especially if you live in anywhere where it snows. Your hair will thank you!